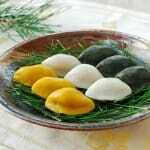 Next Monday, September 8, is Chuseok (Korean harvest/mid-autumn festival). 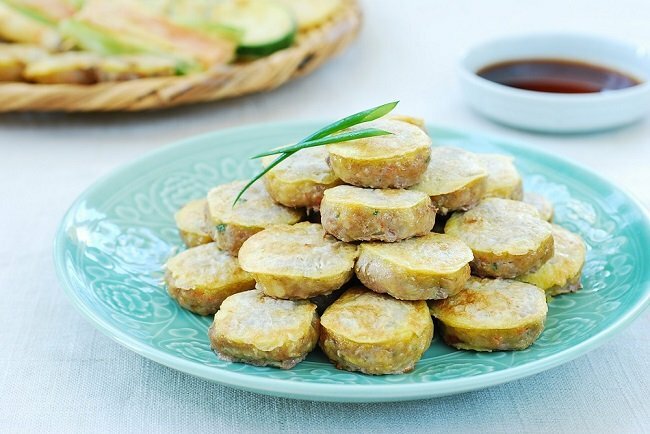 Most Korean homes make several types of jeon (전) dishes (pan-fried battered food) for their holiday feast. Wanjajeon (완자전), egg-battered and pan-fried Korean meatballs, is among the popular choices. It’s also called gogijeon (고기전). Meatballs are called gogi wanja (고기완자) in Korean and used in many traditional dishes such as soups or hotpots. 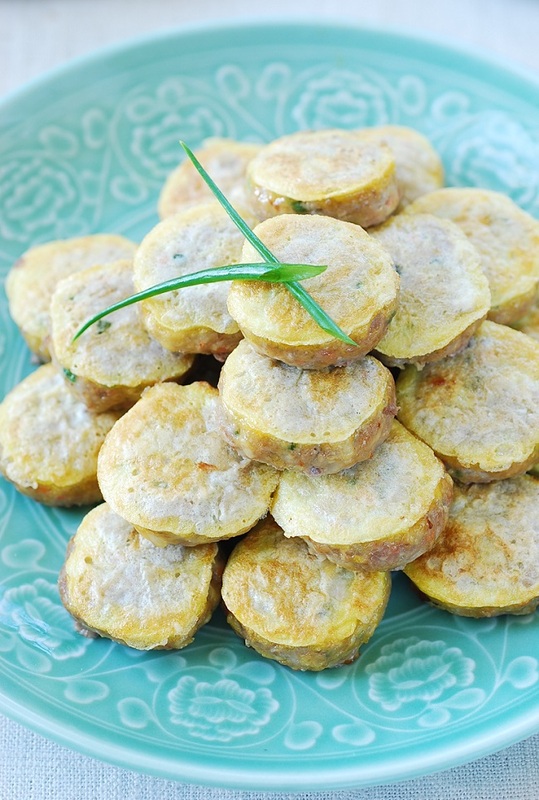 When they are egg-battered and pan-fried, they are called wanjajeon. 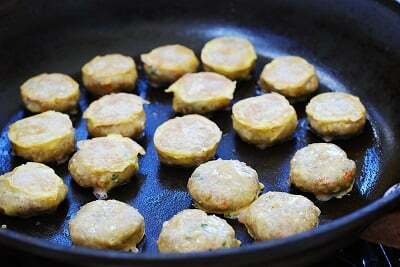 To make jeon, the meatballs are gently pressed into mini patties. As a child growing up in Korea, I loved these little egg-battered meatballs. 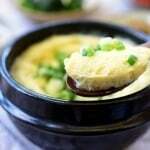 We called them by their funny nickname – dongeurangddeng (동그랑떙), meaning “a round thing”. I know it’s hard to pronounce, but it is one of those words that makes you smile when said or heard. They were a favorite for packing in the school lunch boxes. Meat was a luxury in Korea back then, so it was always a special treat to have a few of these meatballs with a meal. 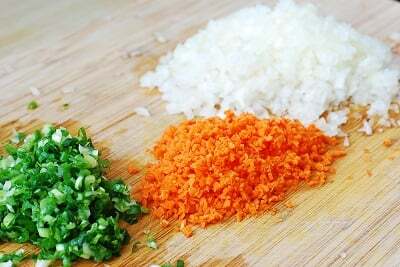 For the meat, I prefer to use a mixture of beef and pork, but you can also use all beef or all pork. To achieve a smooth texture, take extra time to finely chop the vegetables and mix all the ingredients very well by hand. 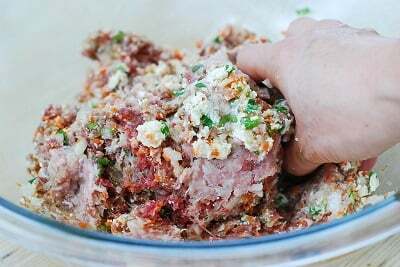 The meat patties can be prepared ahead of time and pan-fried on the day of serving. 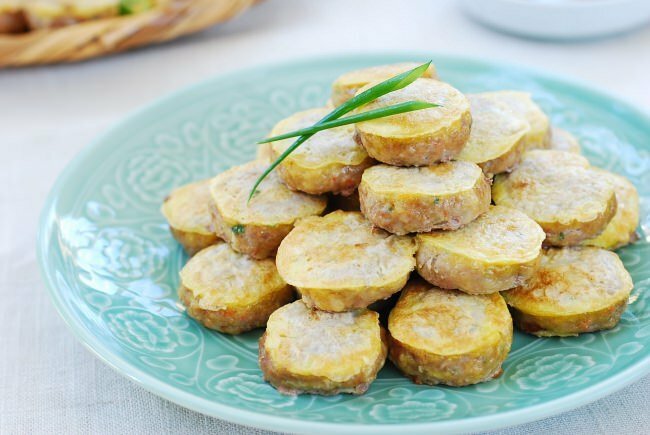 Enjoy it on your Chuseok table or simply as an appetizer or side dish with any meal. Korean meat balls flattened, egg battered and then pan-fried. Soft, moist and delicious! 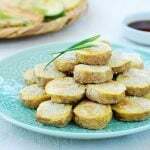 Combine all the prepared ingredients, and mix very well by hand until everything is evenly blended, crushing any remaining big pieces of tofu. You can cook a little bit in the microwave (or in a pan) to see if it needs more salt. 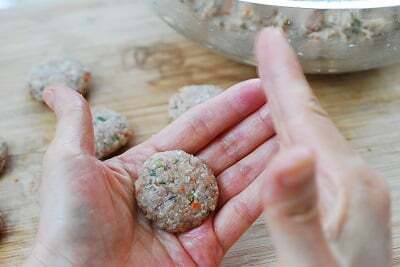 Shape the mixture into 2 to 3-centimeter balls, and then gently press between your palms to flatten. 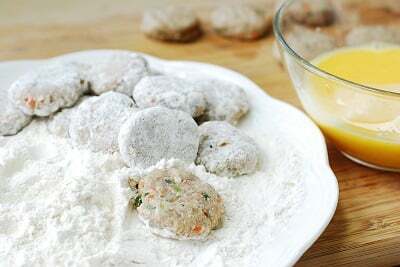 Dredge the patties in flour one at a time, coating well. Shake off excess flour. Heat a non-stick pan over medium low heat. Coat the pan evenly with 1/2 tablespoon of oil. Dip each piece in the egg, and carefully place in the heated skillet. Cook for about 2 minutes on each side, adding more oil, until the meat is cooked through. The meat is ready if it feels firm. Clean the pan, and repeat with the remaining pieces. Pictured is a dipping sauce. Is it just soy sauce? 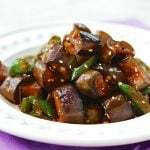 Do you have a sauce recipe that goes well with jeon? I have saved this in my “recipes” folder and want to thank you for posting this, and many more thanks for the the beautiful and most helpful photos. 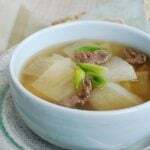 When I shop at my local Korean market (we have BIG ones where I live) if I am lucky the ladies are making and selling food like this. I’ve always wanted to make it for myself, and now I can! You go to so much trouble to do such a beautiful job when you post your recipes. Again, thanks you so much! Aww thank you so much for the nice words! Hope you try it soon. How can I make this without any egg (because of an allergy)? 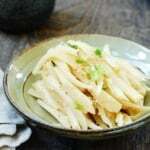 What type of Tofu (i.e. soft, medium or hard) should we be using? The harder ones will have less water to deal with. Use medium or hard. Sorry about the late response. It was hard to keep up with emails and comments during my recent trip to Korea. May I know what flour are you using? I usually use King Arthur brand or Gompyo, a Korean brand. ItIt seems delicious, i’ll try it for sure. Pinterest seems to be blocking you web page. Thanks for bringing it to my attention! I’ve contacted Pinterest, and hope to resolve it soon! Cheers! Will this turn out ok if I skip the flour? Celiac here so can’t have gluten. Can I substitute coconut flour? Thank you!! Coconut flour is extremely absorptive, you can’t substitute regular flour with it. Try using corn starch instead. It’s used instead of flour for many fried Asian recipes and I believe it does not contain gluten. These are delicious served as an hors d’oeuvre! I doubled the recipe and they were still gone within 10 minutes. It is a good thing that I also made the fried Mandu (which also went very quickly). 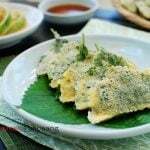 Every recipe that I have tried from this website has been delicious and easy to make, although the mandu takes more time than the wanja. 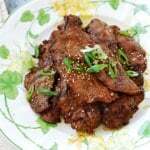 Thank you for posting these recipes of Korean classics!